This depends on a variety of factors: the rail operator, your fare type and whether you have an e-ticket or print-at-station ticket. Unfortunately it isn’t possible to change the name. All of these E-Tickets are strictly nominative and non-transferrable between persons, meaning the name cannot be changed or modified. Instead the only option is to re-book a new ticket and cancel (if possible) the previous one. If you have entered an incorrect name or have made a spelling error you luckily still have some options left! Please click here to find out what you can do. If you have a print-at-station ticket, then someone else may use it as it is not nominative ( this does not apply to Eurostar tickets as they are strictly nominative). These types of tickets also do not have any names printed on them, so it is very easy to sell them to third parties. Please consider that the person using the ticket must be in the same age range (if a youth/senior discount has been applied e.g. Thalys Jeune fare) or must also have the same discount rail card (e.g. Carte Senior+) as the original ticket holder if one was used when making the booking. All Eurostar tickets are strictly nominative and non-transferable between persons. This means that it isn’t possible to change or modify the name on a ticket. If the passenger’s name needs to be changed and/or if a new person will be travelling, a new ticket has to be booked and the previous one can be cancelled (if possible) instead. Please remember that valid I.D. must be presented along with every ticket. If you have entered an incorrect name (e.g. maiden instead of married surname) or have made a spelling error, you luckily still have some options left! Please click here to find out what you can do. All Renfe tickets are strictly nominative and non-transferable between persons. This means that it isn’t possible to change or modify the name on a ticket. If the passenger’s name needs to be changed and/or if a new person will be travelling, a new ticket has to be booked and the previous one can be cancelled (if possible) instead. From there you will be able to see the option to cancel the ticket. Cancelling the reservation is free of charge if done via OUIBUS’s website or app. Once you have cancelled the ticket, you will then receive a voucher for the value of your ticket. You can then use this voucher to book again with the new name. You can also change the name directly from any of the OUIBUS ticket offices. This change will be incur a fee of €5 per passenger. 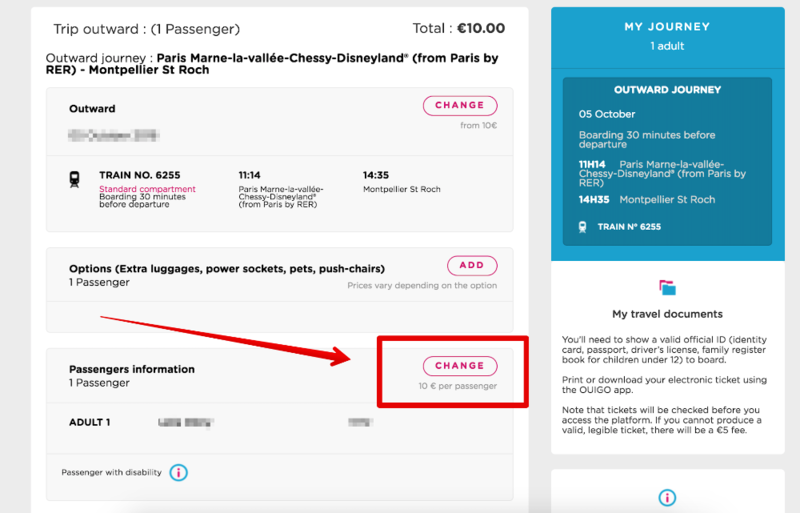 It is possible to change the name on a OUIGO ticket, for a fee of €10. To change the name on your OUIGO ticket, visit the Tickets section of your Trainline account and click the link to exchange on OUIGO.com. If you do not have an account, you can visit the confirmation page of your booking. From there, click on the link to exchange on OUIGO.com. You can find the link to the confirmation page of your booking in your confirmation email. 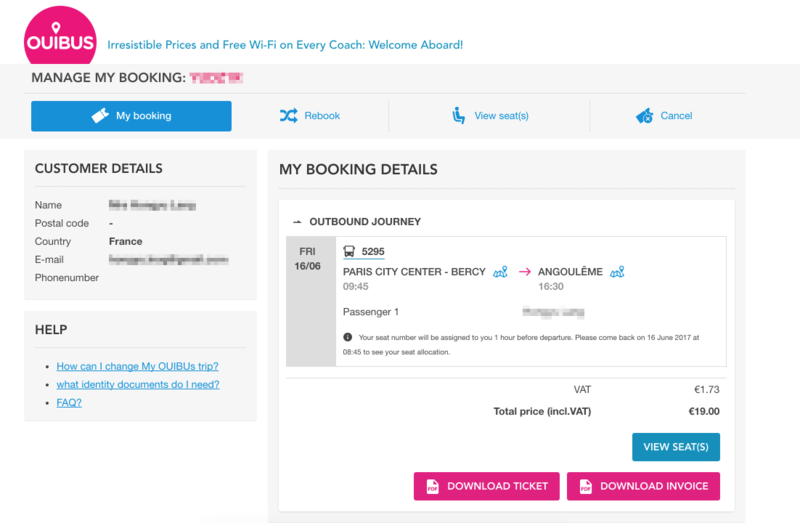 On OUIGO.com, you will first need to login using your booking email and 6-character booking reference. Once you’ve done this, you can scroll to the bottom of the page and click on “Change”. From there you can proceed to modify the passenger’s details, after which payment will follow. Tickets for the following types of trains are not nominative and can be used by someone whose name does not appear on the ticket. If you've made a spelling error in the name or someone else wishes to travel with the ticket, it is possible: Frecciarossa (FR), Frecciargento (FA), Frecciabianca (FB), Intercity (IC), and Eurocity (EC) between Italy and Switzerland ( note: this does not include Thello trains). Tickets for the following types of trains are strictly nominative and cannot be altered or used by others: Intercity Notte (NI), Regionale (RE), Regionale Veloce (RV), Thello. If the passenger’s name needs to be changed and/or if a new person will be travelling, a new ticket has to be booked and the previous one can be cancelled (if possible) instead. 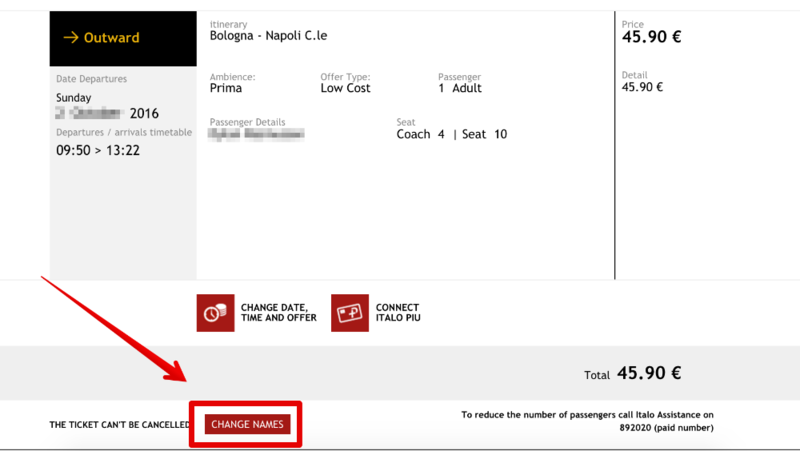 It is possible to change the name on a Italo ticket for a fee. To change the name on your ticket, you can do this directly on Italo’s website. Just visit the “manage your journey” section on the following page. Then just enter your booking name and reference to login. You can find your booking reference in your confirmation email or your account. From there you can proceed to change or modify any passenger’s information. All Thello tickets are strictly nominative and non-transferable between persons. This means that it isn’t possible to change or modify the name on a ticket. If the passenger’s name needs to be changed and/or if a new person will be travelling, a new ticket has to be booked and the previous one can be cancelled (if possible) instead. I have entered an incorrect name for my tickets. What do I do? The names used for tickets are derived from your passenger details. This means that all names entered for yourself or any other passengers must match the ID (e.g. passport, driver’s licence) you will be travelling with. If you have signed up with Facebook, then you must make sure that your passenger name reflects your ID, and not your account name. 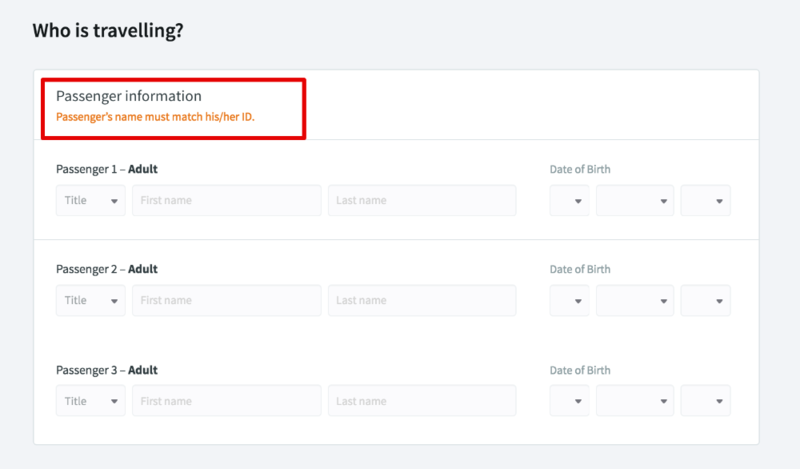 Your account name and personal information can be changed in your preferences. All passenger names can be changed in the passenger profile section, on the search page. As soon as you have paid for your ticket, Trainline automatically reserves this ticket with the rail operator using the details you have provided. So you are bound to the ticket conditions as soon as you have confirmed your purchase. If you have purchased a Semi-flex or a Flexible ticket, then you can still exchange or refund your ticket. This means you can then buy a new ticket and change the name, date of birth or any other necessary details. If you would like to exchange or refund your ticket, read this article to find out how. If your name on the ticket is Pat Smith, whilst the name on your passport/ID is Patrick Smith, then you shouldn’t have much to worry about, especially if your date of birth is correct. It mainly needs to be clear that the travelling passenger is the intended ticket holder. So a spelling mistake won’t be too difficult to explain. It is still up to the ticket inspector whether they accept the ticket as valid in the end. Though if it’s a minor difference or mistake then it should be okay. Print-at-station tickets can only be collected once, therefore they are not tied to a particular name. So as long as the travel fare is valid (e.g. this would not include an adult travelling on a youth ticket) then there will no issue if a different passenger travels in place of the person who has purchased the ticket. This is because the ticket may only be collected once and therefore cannot be reproduced (which is not the case for E-tickets). Can I take a different train than the one I booked? Can I depart from any train station in a city or do I have to choose a specific one?